Kenya's President Uhuru Kenyatta's struck a reconciliatory tone as he reached out to the opposition to work with him in developing the country during his second term in office. The main opposition coalition the National Super Alliance (Nasa) dismissed the results of the hotly contested election as a charade and boycotted the ceremony declaring President Kenyatta's victory. The Independent Electoral and Boundaries Commission (IEBC) declared President Kenyatta the winner with with 8.2 million (54.2 per cent) votes against Raila Odinga's 6.7 million (44.7 per cent). Six fringe candidates accounted for about per cent of the 15.07 million votes cast. In his acceptance speech, President Kenyatta urged the opposition to support his government in order to drive his development agenda over the next five years. The president also rallied Kenyans to put aside their political differences and live peacefully. In apparent reference to the divisive campaigns leading up to elections, President Kenyatta said: "Kenya will still be here after elections. Reach out to your neighbours because we are all Kenyans; your neighbour is your neighbour; there is no need for violence." He pledged to continue with the work he started in his first term of developing the country. President Kenyatta will meet a full in-tray in his office, with demands from his re-election pledges and challenges caused by a two-month campaign period likely to put him on his toes for the next five years. President Kenyatta now needs to reach out to the rest of the country who supported the opposition, and provide leadership. The opposition described his first term in office as being exclusionist and accused his administration of plunder of public resources. The opposition had listed national unity as a priority should they win the elections. Two months of gruelling campaigns revealed deep division and anger in the country, especially among the youth, who form the majority of the Kenyan population. The young people mainly complained about the high unemployment rate. President Kenyatta gave several promises during his campaigns, among them that he would create an internship programme that would see hundreds of thousands of graduates absorbed by public institutions and the private sector for one year. With a depressed national budget and heavy borrowing that is putting pressure on revenue collected by the Kenya Revenue Authority, the government will be required to go engage in resource mobilisation to fund new projects and fulfil their election pledges. For instance, by January 2018, the Jubilee administration said it will commence free secondary school education. The government has already allocated Ksh5 billion ($50 million) in the current budget to finance infrastructure in public secondary schools. To defend his legacy, President Kenyatta will also focus of completing infrastructure projects, which will require billions of dollars, among them the standard gauge railway line from Naivasha to Kisumu and eventually to Malaba border, new roads, and electricity connectivity across the country. The new government is also coming into office with increased numbers of members of parliament on its side, but succession politics, which reared its head during the party primaries, could prove a headache for President Kenyatta as he seeks to lead a united party. Deputy President William Ruto, insiders say, has already made it clear that his strategy to succeed President Kenyatta will commence immediately after they assume office for the second term, and that he could be seeking political realignment, which could destabilise the ruling party. Mr Ruto, who has been credited for the win in the just concluded General Election, has been accused of influencing the removal of many members of parliament during the Jubilee Party primaries to pave the way for election of his allies. President Kenyatta will thus be forming a government with the majority of MPs in his party having allegiance to his deputy. 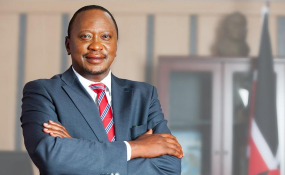 President Kenyatta's relations with fellow presidents in the region featured in the campaigns. The opposition claimed that he had been isolated, after his Tanzanian counterpart John Magufuli appeared to enjoy support from Rwanda, Burundi and Uganda, who have preferred to use the Central Corridor for their respective countries' infrastructure projects. Food insecurity, lack of decent jobs for hundreds of thousands of youth, and industrial disputes remain unresolved. In his campaign, President Kenyatta assured the country that he would come up with an elaborate plan to spur economic growth to address some of the challenges. Lack of Kenya's staple, maize flour, on the shelves was part of his campaign agenda. The government resorted to importing maize from Brazil and Zambia to ease the pressure. Currently, nurses are in their third month of a national strike pushing for the signing of a collective bargaining agreement, which requires additional funds from the exchequer. Declaration of the presidential election results ended days of anxiety although the country was still on edge following the opposition's rejection of the results. The announcement was met with celebrations by Jubilee supporters in Nairobi and the president's strongholds. Nasa in an earlier statement had warned that going to court to challenge the results was not an option. Observers said this was a worrying sign as it could result in violent protests, pitting the coalition's supporters against the security forces.